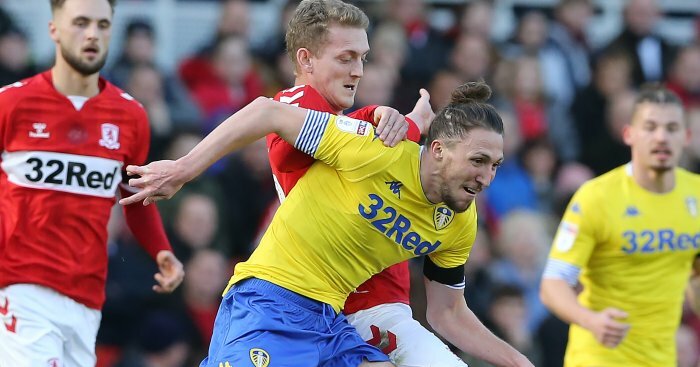 Leeds boss Marcelo Bielsa has hailed Luke Ayling as “a complete player” despite the defender’s worrying lack of form of late. The former Bristol City full-back has struggled to hit the heights he did at the start of the season after returning from injury in December. The right-back picked up a knee-ligament injury in October and missed two months of the season, returning against Aston Villa in late December. Bielsa, speaking at today’s Thorp Arch press conference, paid tribute to the 27-year-old Leeds star, but explained his forays forward of late have been reduced. “For me Ayling is a great player, he is a complete player. When I say complete I mean he can manage all aspects of the game, he can defend as full back and as a centre-back,” said Bielsa, who again named his XI to face Swansea with Pablo Hernandez replacing Jack Clarke the only change. “He has an aerial game that is not very common for players who play as full-backs and if we divide the pitch in three segments taking into account the right side of the pitch he defends well, he is well playing out, he takes risks when we have to organise and when we have to use the ball and the only thing that has decreased a little bit is his defensive impact. “He is a player who usually gets grades over seven points but now he is getting six points, the thing we can’t do is to look at everything so we divide and we comment only on the last games. Ayling, who will line up against Swansea in the Championship at Elland Road on Wednesday, has played 10 games since returning from injury and Leeds have only kept only one clean sheet – the 2-0 win over Derby.